My wife and I are the proud owners of a female Jack Russell. Her name is Lili-Anne and she is only a year and half old. We are new to the Jack Russell. And would love to hear from other owner's and breeder's. Lili came into our home because we lost our 12 year old beagle to old age. It has put such a sore in our hearts that we thought we would never get a dog again. For a month or so we were looking at other puppies and dogs to bring into our home. But we really never jumped on it. But after 3 weeks of hearing my wife cry in her sleep and begging for our Molly to come home, I could not take anymore of seeing her unhappy. So I went to all the Dog Shelter's and started looking on my free time to surprise her. but because we are in a Apartment we were not able to get any big dog's and allot of the shelter's only had large dog's and our landlord would not allow it. So I continued to search. and then found Lili. The family did not want to part with her but financial reason's wanted to have her go to a good home, which she is in now.We drove 99 miles each way to get Lili and we are so happy we did. We are learning so much about her but we want to know about her more. The internet is not really a valuable tool to use because it gives us all the wrong answers. Lili is short haired and we are trying to find out if she will grow hair like "eddie" in Fraiser. I hope to hear from every one who has one. What are safe foods for her to eat, what type of treats should she have ect. She has a hard time to be left alone, my wife works 12 hours in a factory and I work as a Automotive Inspector where I am gone for about 5 to 8 hour's. We do not want to cage her even though she has been raised in cages, but we do not want her to freak out. My kids help out to keep her calm, but she cries for me and my wife. Is that because she met us first and not the kids? 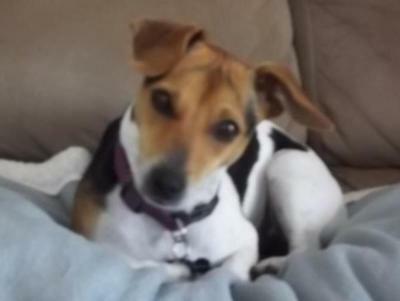 I would love to have a one on one conversation with a JRT owner and be serious to help us. I am on facebook and I answer all emails. I am thomasmagee05@gmail.com on facebook and that is also my email address. I really do hope to hear from someone. So here is a picture of Lili and I hope to hear from all owners.